The Diamond Filter is so powerful it is designed to last for 4 months! You will have clean pure water and never have to worry about counting days or setting reminders for yourself as to when to replace your filter. We do all the work for you! Every 4 months we will automatically send you a new drinking water filter, and that’s how you’ll know it’s time to change your filter. You’ll never have to pay for replacement filters. The cost of the filter is built into your cost of only $14.95 per month. 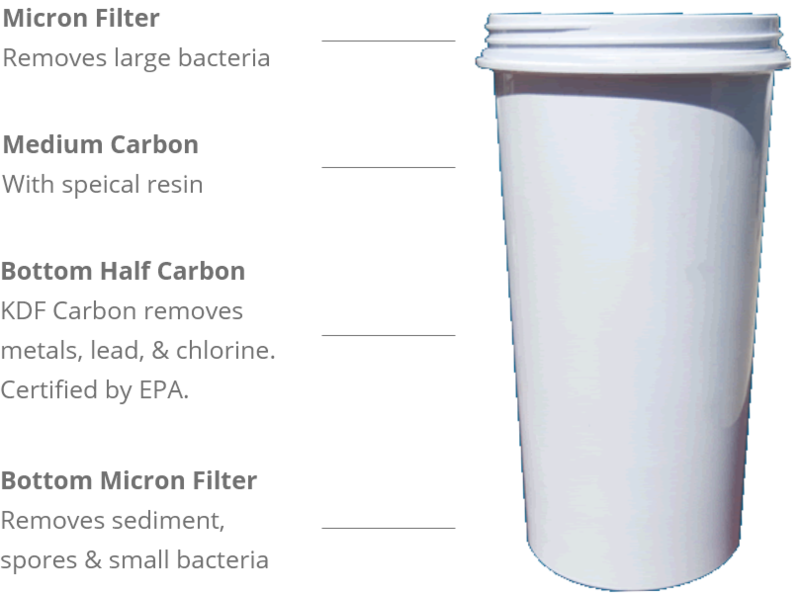 The Diamond Filter is proven to be more convenient than other drinking water filtration systems on the market. With our drinking water filter on your cooler, you will have the ability to hold up to three gallons at a time. Unlike some of the pitcher filters which you have used in the past, you never to have refill multiple times a day. It also won’t take up valuable space in your refrigerator. Are you currently a spring water customer? Our method of drinking water filtration is a perfect opportunity for you to save yourself some money and hassle. With the Diamond Filter there will never be bottle deposits, waiting for deliveries, or worrying about where to store all those bulky bottles. Best of all there is no more lifting heavy bottles! Its design also accommodates the needs of the elderly or people with back problems. Have more questions about drinking water filters? Our drinking water filters are simple to use. You’ll be enjoying clean and pure water in minutes! Place the plastic washer on float valve and screw float valve into bottom of lower bucket. Place ring adapter on top of open reservoir of cooler, then place assembled lower bucket into your water cooler. Install Dome into upper bucket. Tighten with washer and nut. Twist Filter cartridge into upper bucket. Place upper bucket onto lower bucket. Fill the upper bucket with tap water and enjoy clean refreshing water! After set up you’re ready to go! Simply pour tap water into upper bucket. Reminder: Be sure not to overfill your filter bottle. Water level should not go above midline.